The bars in Krakow are largely aimed at the partying tourists, each claiming to offer "the best cocktails in town", with promotions girls on the street trying to talk you in. However with a bit of research, like our list below, you can figure out which claims are true and also find some unique venues away from the stag-parties and large rowdy groups. When in Krakow, you should obviously try the vodka, normally chilled and drank as a shot. With so many flavours available - the most popular being Wiśniówka (cherry) or Orzech Laskowy (hazelnut) - you should have fun trying to find your favourite. Also try the excellent local Miód Pitny (mead) or, if you're feeling brave, the Wściekły Pies (Mad Dog); a shot of vodka, raspberry syrup and Tabasco sauce which is made to resemble the Polish flag. The locals also like to put fruit syrup in their beer. Opened in late 2015 by the same team behind the various Pergamin apartment hotels, Pergamin restaurants and Pergamin cocktail bar (below), at first glance, this stunning venue, set in an ancient building, appears to just be a deli selling regional meats and cheese, however step inside and you will find a welcoming informal bistro at the back, serving excellent Polish food. Go down the stairs at the far end of the restaurant and you will descend into a beautiful large brick cellar with a more formal restaurant, offering five different tasting menus. 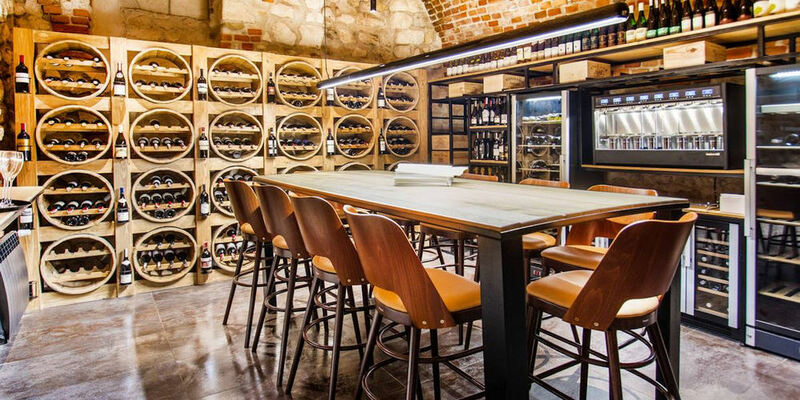 The fun doesn't stop there though; If you walk through various impressive rooms in the restaurant, passing the elegant cigar room in the process, you will end up in a large room, formerly used as a coal cellar, which is now a wine shop and tasting room. The walls are decorated with shelves of fine wines from Poland and the rest of the world, each available by the glass (which seems crazy when you look at some of the bottles on offer) - the best of which are kept in the wine dispensing machine. Head Sommelier Ewa will help you pick a wine to match your taste or, if wine is not your tipple, then head to the amazing cocktail bar in the corner of the room. Here you will find a wide selection of premium spirits with many rare Polish vodkas and some of the best signature drinks in Krakow, including the Cola50, which comes decorated with a genuine old 50 złoty note from communist times. This place truly is remarkable! Closes rather early by Krakow standards though, at 23:00 every day. "Once Upon A Time In Kazimierz" is a delightful restaurant and bar which could be taken straight from a Hollywood film set. Taking you down memory lane to a bygone era when Poles and Jews lived side by side on this corner of the very heart of the Jewish quarter. Decorated on the outside as a row of curious shop fronts with shabby-looking display windows and much-weathered signboards still proudly announcing their owners’ names: Nowak, Holcer, Kac, Weinberg, Rattner, Kohan. The interiors of these dimly lit shops are fitted out exactly as they used to be, albeit their separating walls long been pulled down, turning them into a single cosy, candlelit truly unique venue. Sit down at an original carpenter’s workbench and enjoy traditional Polish and Jewish cuisine and drinks with live music. The first secret speakeasy in Krakow opened in 2015 and focuses on serving good creative cocktails. Hidden away, you need to enter through the entrance to Smakolyki restaurant at 28 Straszewskiego street, and walk through the cloakroom to the American Prohibition-era themed bar. Open Wednesday to Saturday only. This was the very first (and still the best) vodka and śledź (herring) bar in Krakow, spawning countless copycats all over town, each taking advantage of the local's addiction to both pickled herring and the national spirit which are sold together for just 12zł. You will find two branches of the "Herring Embassy" on Stolarska street, each just a few doors apart - the original (and best) at no.8 opens until midnight, whilst their Śledź u Fryzjera at no.5 stays open until 07:00. There's also a third branch (Mały Śledź) in Kazimierz open throughout the night too. No visit to Krakow is complete without trying the local delicacy. Opened in June 2016 and literally translated from Hebrew as "Cool", this secret cocktail club, hidden up the stairs above Hamsa restaurant in the Szeroka square in the heart of Kazimierz Jewish Quarter, lives up to its name. A stunning array of different rooms, with beautiful chandeliers and a dancefloor, the cocktails, produced by a team of hipsters, are amongst the best in town and offer a mix of the Near East meets West with plenty of Jewish influence. Open until midnight and 03:00 at weekends. Closed Monday and Tuesday. Located just off the Old Town Square, this friendly cafe bar is a popular place to meet up over beers. Split into three smoking and non-smoking rooms, it is beautifully decorated with an old fireplace, candles and small tables. There's a huge tea selection and plenty of syrups to put in your beer, as many people do in Poland. However it's in the cellar (or "dungeon") below where you will find all the action. 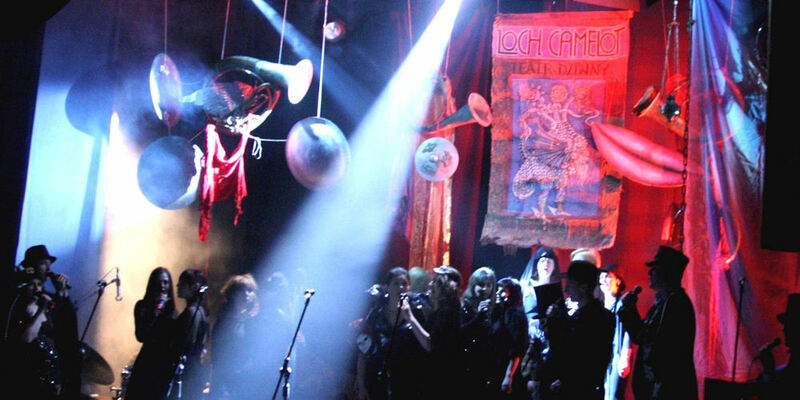 Home to a fantastic cabaret and jazz bar, it's well worth a visit when in Krakow. Cash only. This pretty little alcohol shop just off the main square is decorated with a piano and a long wooden bar, behind which sits a beautiful array of traditional Polish drinks, all from the local region. What makes it so unique, and also why it places so high on our list of best bars in Krakow, is that all the drinks in the shop are available to taste... for free! With so many flavoured vodkas, including fresh mint, chocolate and milk, alongside hot honey wine and other old Polish liquors, you could literally spend the entire day in here and have all your Christmas shopping done in one shop. Don't forget to leave a generous tip for the friendly shopkeeper / barman. Opened in July 2016, "From Mouth to Mouth" is perhaps the most secretive cocktail bar in town, as its name would suggest. Walk past the queues for the Taawa nightclub in the Kazimierz Jewish Quarter, ignoring security as you do so, and head up the stairs to the Klub Bilardowy PIK pool hall. Here you will see a toilet door that say "out of order". Some of the most imaginative cocktails in Krakow await those who choose to ignore the signs. Open until 03:00. Closed Monday & Tuesday. Opened in the shell of the closed down former Soviet-era Forum Hotel in 2013, on the opposite side of the River Wisla, this cafe, bar and club is more reminiscent of Budapest's ruin bars or the reclaimed hipster venues in Berlin, than what you would normally expect in Krakow. As a result, it is one of the most popular venues in town, especially in summer when you can sit by the river and overlook the city from the comfort of a beach chair, watch the outside cinema or dance the night away to DJs. In winter there's even an ice rink. No visit to Krakow is complete without tasting the famous Polish vodka and there's no better place in town to do so than at this intimate tiny bar. Set over two floors, there's various flavours to choose from alongside a selection of vodka based long drinks. We highly recommend the vodka flights though, allowing you to try a selection in one sitting. Named after the vintage sewing machines which decorate the room, this late night party bar in the vibrant Kazimierz Jewish Quarter is a Krakow institution. Dark and candle lit, the bar comes to life when other bars close (it's open until 03:00 during the week and 06:00 Friday and Saturday), as tables act as makeshift dance floors and everybody goes wild to the Klezmer, Balkan and Swing music. Opened in November 2016 in a former synagogue in the heart of the Kazimierz Jewish Quarter, this stunning bar from the team behind Klub Alchemia and Bunkier Cafe (both below) is a wonder to behold... if you can ignore the gordy 1990s style red leather chairs. Despite being badly damaged in WWII, the original frescos are still on display and the original mechitza balcony, which was used to separate men and women, stands above the well stocked bar, and is used to house the beer tanks. Open until 02:00 daily (04:00 at weekends). This dark bar on the corner of Plac Nowy in the Kazimierz Jewish Quarter boasts uneven floors, old furniture, candles and random portraits on the wall. They have a great selection of beers, vodkas, and amazing hot chocolates It was the first of the period style cafe bars in the area and now attracts tourists and locals alike in large numbers thanks also to its popular live jazz club downstairs. Open until 04:00 everyday. This gorgeous 1920s style bar in the vibrant Kazimierz Jewish Quarter specialises, as you may have guessed, in absinthe. Served in the traditional way, they have over 20 variations of the "Green Fairy" to choose from, the best in Krakow. Various vodka flavours, original absinthe cocktails, hot drinks and over 30 cold regional beers are also available whilst the music skips from jazz and blues to 70s and 80s. Open from April until the end of October, the terrace bar on the fifth floor of the plush Sheraton Hotel offers some of the best views in Krakow. There's no better place in town to enjoy the afternoon sun or sip cocktails as you watch the sun set over the Wisla River and Wawel Castle. A retractable roof offers some shade on hot days, as well as wind and rain protection when required. This hipster hangout in the vibrant Kazimierz Jewish Quarter is decorated with recycled furniture, offers delicious Fair Trade Coffee and alternative music. More relaxed, bright and contemporary than the other bars in the area, it's a great place to watch the world go by whilst sitting on hammock chairs and sipping on a smoothie, a cocktail, beer, or one of the many tasty homemade infused vodka or bourbon shots. They say that "anything that can be infused is infused" and we highly recommend the rhubarb infused vodka in summer or gingerbread infused vodka in winter. This incredibly popular bar and restaurant in the Kazimierz Jewish Quarter offers three very different drinking environments in six rooms under one roof, each serving what can be confidently described as "the best cocktails in Krakow" (a much misused claim you'll see made everywhere else in town). Celebrated local mixologist Dominik Ubysz is behind the creative menu - he was pipped to first place at the World Class Poland 2015 Finals by just 0.39 points (by Mateusz Szuchnik from El Koktel in Warsaw). Don't be confused by the two differently named entrances as they are both for the same venue - "Le Scandale" leading directly into the Great Gatsby themed cocktail bar on Plac Nowy, opposite the famous Zapiekanki takeaway stalls, and the other next to it, down the passage to the "Garden Le Scandale", a huge garden at the back (covered in winter) with its own cocktail bar and, in summer, a further small Tiki rum bar. It's the perfect place to spend a relaxing afternoon or sample deliciously crafted balanced cocktails, like their own take on the Mai Tai. At weekends there's live music and DJs making it very easy to get lost here for your entire trip to Krakow. This flagship brewpub in the Old Town from leading Polish craft ale producer PINTA opened in June 2014 and offers 14 of their wonderfully named multi-award winning brews on tap, alongside many bottles from other small Polish craft breweries. In summer, the beer garden at the front is also one of the most popular places in town in Krakow. Next to the famous Tempel Synagogue you will find one of the oldest pubs in the Kazimierz Jewish Quarter and possibly the last traditional pub in Krakow. Open from midday until the last customer leaves, hundreds of mementos and tokens from the times when Poland was part of the socialist block are displayed around the bar, with a separate smoking room, darts and chess adding to the atmosphere, with a cellar showing sports on the big screen. Together with many flavoured Polish vodkas, the speciality of the house is the ultra strong Wsciekly Pies (Mad Dog), which is made with vodka, Tabasco sauce and raspberry vodka instead of raspberry syrup. Located in the peaceful Planty Gardens, within the Old Town, and next to the Bunker Sztuki contemporary art gallery, one of Poland’s most important art institutions, this popular all year round terrace bar not only serves great coffee but is also one of the only places in Krakow to serve tank beer, which is transported directly fresh each day from the brewery, free from pasteurisation and microfiltering. Kept at 4°C - 6°C from brewery to tap, it is never in contact with air or carbon dioxide until it hits your glass. From the same people as Le Scandale (above), this elegant and glamorous restaurant and premium cocktail bar, just off the main square, offers some of the best drinks in Krakow although is more expensive than most Krakow bars. 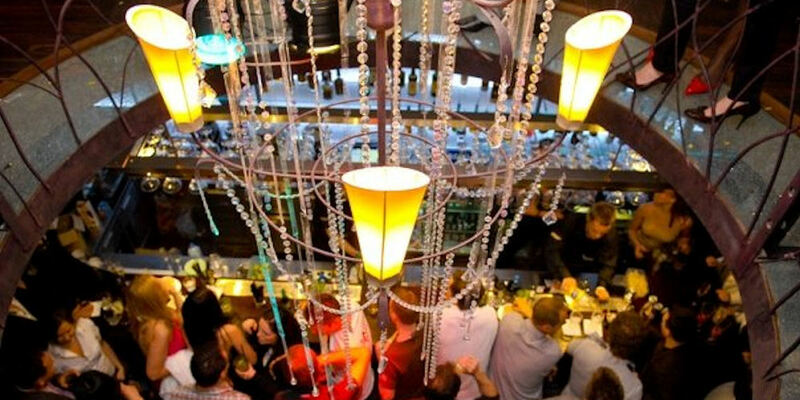 There's a great selection of creative cocktails and wines, with special events, wine tasting, and cocktail classes making it one of the nicest places in town to drink. Go for the 5 O'Clock cocktail, a boozy mix served in a teapot. Hidden down a passageway at Floriańska 16, follow the smell of incense and you will find the "Holy Cow", a delightful Oriental inspired candlelit cellar bar that offers a great alternative to the many tourist bars in this part of the Old Town. Signtaure cocktails, DJs and a unique atmosphere, make this one of our favourite bars in Krakow. Oh, and the fact it's open every day of the week until 04:00. This smoky basement Soviet-era theme bar and club is another place to go if you want to grab a feel for Poland's communist past. Alongside vintage memorabilia, the DJ booth is even made from an old communist "Żuk" car, from which DJs spin mainly 1960's, 70's, 80's and 1990's Polish and American hits. The drinks menu is mainly made up of aptly named shots, available by the flight. This literary and musical colourful hangout near Wawel Castle first opened its blue doors in 2002 and features four blue wardrobes, one of which two people can sit inside. It regularly hosts book readings, poetry nights, art displays and music events, easily making it one of the most interesting places in Krakow. This live music bar, situated in a historical building in the centre of the Old Town, first opened in the 1990s and is considered as one of the best jazz clubs in Poland. Set over two levels, some of the greatest names in world jazz have performed here. The main concert room can get smoky, however the cellar is also connected to a whisky bar with the longest bar counter in Krakow, serving over 50 whiskeys and perfectly prepared cocktails. Translated in English as "Peace and Quiet", this two-room Bohemian drinking den is hidden up some stairs in a courtyard, just off the famous Bracka Street in the Old Town. Open until 03:00 daily, the colourful retro 1960s surroundings attract hipsters and students for its good choice of Polish beers and huge choice of syrups, with which Poles like to mix them with. The ninth branch of the Polish brewpub chain opened in Krakow in summer 2015, serving four of the brewery's ten award-winning home brews at one time. Bavarian inspired, in true Oktoberfest style, the beers are brewed using German purity laws and served in 1 litre steins (0.4l also available), however it's the 5 litre kegs that are the main talking point. Televisions broadcast live sports in every room (Premier League football obviously being popular), and beer friendly Polish and German food is served by waitresses in dirndls. The "Land of Whispers" is set over two floors of a backstreet building in Krakow's Kazimierz Jewish Quarter, with outdoor seating in summer. Decorated with antique furniture and vintage black and white photographs of naked women, if it wasn't for the modern music, you'd describe it as having an 1800's bordello feel. Downstairs is for the non-smokers, whilst at the top of the creaky staircase you will find comfy sofas, chandeliers and a real fireplace. The cocktails are the main attraction, mixed using their own homemade bitters - plum, orange, grapefruit, and rose petal. Try the Orange Old Fashioned or Plum Whisky Sour to taste how good these are. Cash only. Dating back to 1364, when a splendid feast took place on a house here on the main Market Square, this is one of the most impressive restaurants in Krakow, and also one of the oldest in Europe. As well as hosting royal wedding receptions, the guest book has been signed by kings, queens, presidents and prime ministers from around the world, together with Hollywood celebrities and other famous personalities. A new addition to the restaurant is the Champagne Bar, which also offers an exquisite interior, cafe bar atmosphere and luxury drinks, including hot alcohol in winter and special liqueurs, vodkas, meads and whiskies alongside the Champagne. Whilst doing the well trodden tourist route from the Kazimierz Jewish Quarter towards the famous Plac Bohaterów Getta and Schindler's Factory in Podgórze, you will no doubt cross the Wisla river on the Kładka Ojca Bernatka "Lover's Bridge". If so, pay a visit to this superb hipster hangout on Mostowa Street before crossing the footbridge. An outside terrace, art exhibitions, movie screenings and a great selection of craft beers from small Polish breweries alongside Polish fruit wines, ciders, flavoured vodkas and liqueurs, provide enough reasons to take a rest from your tourist walk. This cheap booze bar is one of the best of those that typify many of the tourist and student targeted offerings located around Krakow's Old Town. Open 24 hours a day, the many beers, vodkas and drinks are all the same price (4zł), whilst the Soviet inspired bar snacks are all just 8zł. With drinks this cheap and a team of pretty barmaids, it's no surprise that it can get rowdy as the night progresses. This upmarket cocktail bar and restaurant is another boastfully claiming to offer "the best cocktails in Krakow". Located just off the main square (there is also another branch in the Kazimierz Jewish Quarter), it has a beautiful vaulted ceiling and an attractive secret garden in which you can enjoy one of the 200 cocktails, before dancing the night away in the basement. Located inside the Hilton Garden Inn hotel, this is the only bar in Poland accredited by the International Bartenders Association, thanks to its amazing alcohol collection. Instead of spirits you might know, this cafe style bar offers you drinks imported from all over the world allowing you to taste completely new flavours. Alongside high quality cocktails (you even get to keep the shaker), there's rare Scottish, Irish, American and Japanese whiskies, rums from Guyana and Colombia, and of course Polish diamond filtered vodka or a rose petal liqueur. Sharing cocktails are served in a 2 litre "Aquarium", and a "Vodka Challenge" allows you to sample five different vodkas from their impressive list, made from rye and potato, filtered and unfiltered, single and multiple distilled. Formerly known as "Paparazzi" and one of many bars boastfully claiming to offer "the best cocktails in Krakow", this popular establishment just off the main square is decorated with black and white photographs of Hollywood celebrities. Only bartenders with international experience are employed, serving up cocktails based on the best quality alcohol, fresh fruit and juices. There's a smoking room at the back and special offers, including free drinks, help entice customers in. Located in the Old Town in an alley just off the famous Bracka Street, this cocktail bar offers a huge list of drinks broken down into the base alcohol of your choice together with a menu compiled from famous mixologists as well as signature creations, including the fruity "Saddam's Kiss". The main bar boasts sports TV however it's in the more cozy back room where most people choose to sit. 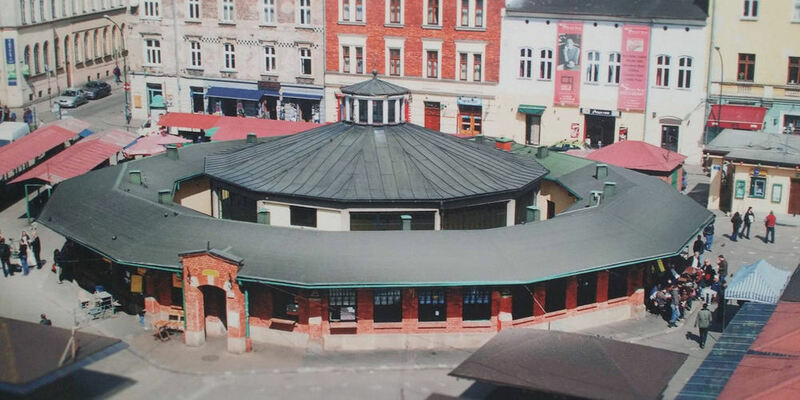 In 1890, on the ground floor of the building at 36 Jozefa Street in Krakow’s Kazimierz district, the Jewish religious organisation, Khevra Ner Tamid, opened its bet hamidrash (house of prayers). It was devastated and desacrated during WWII and afterwards has never served its religious functions again. In 2009, the abandoned building regained its social and cultural functions thanks to the Jewish Culture Festival opening this one room peaceful cafe bar where there's live music, workshops and a library to enjoy with Jewish drinks. "Kiełbasa by barbeque" is not actually a bar but very much part of a night out in Krakow; this legendary sausage stand is the perfect way to end the night, although it may possibly involve a short taxi ride. From the back of a blue Soviet-era Nyska van, two old men in white butchers aprons grill delicious kiełbasa sausages over a wood flame grill. Open every day but Sunday until 03:00. Cash only. OK, I guess if we are including a sausage van, we should also include the other staple of a night out in Krakow. If you're in the lively Kazimierz Jewish Quarter, then no evening is complete without soaking up the booze with one of the delicious open-faced cheese and mushroom zapiekanka sandwiches, available to buy from one of 16 stalls in Okrąglak, the twelve sided former kosher butchers building in Plac Nowy square. Queues form all day and night until 02:00 but choosing a favourite amongst each of the stalls is a personal choice, depending on what other ingredients you like, however the longest queues, possibly because they face the busiest bars, tend to be at Endzior and Bar Oko. Cash only. A real beach bar, on the opposite side of the River Wisla, overlooking the picturesque panorama of the Old Town, this bar, club, swimming pool and restaurant claims to have the "biggest man made beach in Europe", with 10’000m2 of sand. International DJs perform regularly, there's 150 sun loungers to relax on, the cocktails are some of the best in town and the floating swimming pool is built on the biggest barge in Krakow. There's something for everybody here, including beach volleyball and tennis.